Mariana Serapicos is a Brazilian writer/director based in London. After graduating in Radio & Television and having worked in Broadcast TV in São Paulo for over four years, Mariana moved to England in 2012 to pursue her Masters in Filmmaking. Since then she has written and directed a number of short films. 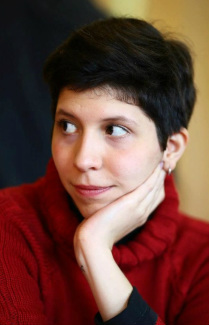 Mariana brings a quirky approach to the stories she tell, addressing dramatic subjects through comedy. Her graduation short film 15/LOVE, about a 12-year-old boy coping with the loss of his father, was screened at the Kids Toronto Film Festival in 2016. Mariana's screenplay The Grandad Project won the BAFTA Rocliffe New Writers Forum Children Media in 2015 as well as the 2016 KCWIFT/KCFilmFest Screenplay Contest. Most recently, Mariana has developed work for the stage, having written and directed Eggs for Breakfast showcased at the 50/50 Scratch Night at the Pleasance Theatre in November 2016.